MGM Boats in Dun Laoghaire Harbour are well represented at this week's Salon Nautico de Barcelona – the Barcelona Boat show – one of Europe's fastest growing on the water boat shows. Jeanneau Sailboats have an impressive display including the new generation of Sun Odyssey’s the 490, 440 & 410 which will be arriving in Irish shores in 2019. MGM's Martin Salmon and Ross O'Leary are present on the Jeanneau power and sailboat stand. 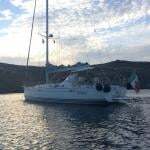 Catamaran brand Lagoon has the 40,42, 50 and 630MY on display and Ross O'Leary is dealing with Irish enquiries. 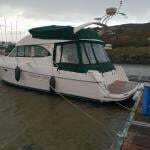 Regular Afloat.ie readers will recall how one Irish couple bought a Lagoon 450s from O'Leary with the dream of a retirement cruise. Meanwhile, Gerry Salmon is on the Prestige stand where the line out includes the Prestige 460, a sister ship to the one MGM boats debuted at Cork Week in July. Also present is a Prestige 520 (which will debut in Dublin in March 2019) and a Prestige 590 new model (replacing the Prestige 560 displayed this year in Dun Laoghaire Marina) along with the new Prestige 630 and Prestige 680. With easy access with regular from flights from MGM Boats say they have an increasing number of clients visiting Salon Nautico de Barcelona this year.